Meow! This Halloween some of us might not have tons of extra cash to buy a $60 costume to wear only once. Or maybe you do, but you are just feeling a little creative anyway. Either way let’s make our own costumes this year! 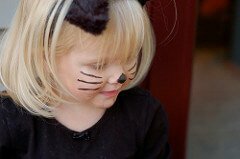 I have a few tips on how to make a very easy and inexpensive cat costume. which will complement your costume, but are also reusable with your everyday outfits. Now all you need to do is make the tail and ears! Take your cardboard and draw triangles whatever size you want the cat ears to be. Cut the triangles out. Trace one of the triangles on the white paper four times. Cut out the four white triangles and paste them on both sides of both of your pieces of cardboard. Use the markers to color the ears black and pink in middle on one side. Hot glue the ears to your headband. Take an old pair of your black tights. Fill the tight with as much cotton as you want. Then just safety pin the open end together, and use the safety pin to attach the tail to your pants or skirt when it’s time to put the costume on.